The "absurd and ridiculous" pressure to have a perfect Christmas puts relationships under strain and "spoils life", says the Archbishop of Canterbury. 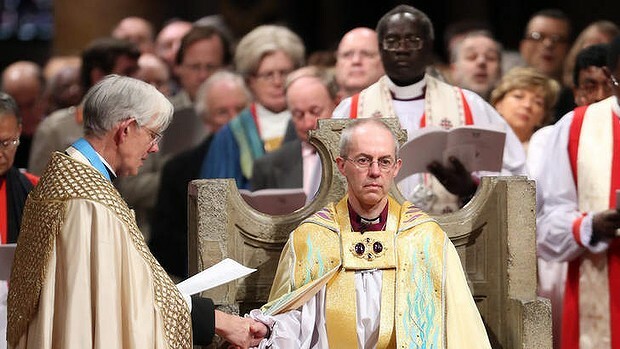 The Most Reverend Justin Welby said consumerism over the festive period was now so "over the top" that couples were arguing over money and children were shouted at. He said he would like to tell people to stop giving gifts altogether but accepts that nobody would listen. However, he added: "Yes obviously the secular over-the-topness, everything you have to have, new clothes you have to have, new this, new that, new the other, is ridiculous, it's absurd, it shouldn't happen. "It puts pressure on relationships because when you're short of money you argue. You get cross with your kids more easily, it spoils life." In an interview with ITV's The Martin Lewis Money Show, the former oil executive accepted that the desire to go shopping would not diminish. "It's obviously not what Christmas is about but to be absolutely honest there's not that much point in saying it because nobody's going to pay attention," he said. "I want to say something positive, which is God gives us his son Jesus Christ to give us life ... a full life and abundant life. "Giving at Christmas reflects that generosity of God. So be generous in a way that shows love and affection rather than trying to buy love and affection. "You can't buy it, you can show it, and when you show it, it comes back at you with interest. "Save up for the Christmas budget, be sensible, don't put pressure on your finances - don't make your life miserable with Christmas. "Share love and affection with reasonable gifts that demonstrate you really care for someone. That makes for the best Christmas you could ever have." The Archbishop denied that he felt guilty about people getting into debt over what is a Christian festival. "The Christian bit of Christmas isn't the bit that's getting people into debt," he said. "It's the whole mercantile trading, shopping, over-the-topness, so I don't feel guilty about it." Earlier this year, he caused uproar when he criticised payday lenders, such as Wonga, who offer high-interest, short-term loans to people with low incomes. He said the Church would support credit unions in an effort to drive them out of business. And last month, he said a single focus on economic growth was not enough to make Britain a "healthy society".